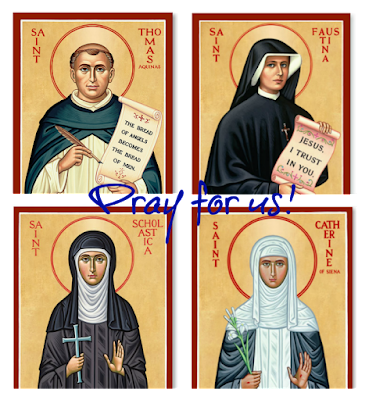 St. Thomas Aquinas (my husband’s confirmation saint), St. Faustina (my confirmation saint), St. Scholastica (Alexandria’s birthday saint) & St. Catherine of Siena (patroness of miscarriages). We go through this litany every morning, and I’ve really enjoyed starting this tradition with my daughter. She will even throw in an “A-Muh!” (amen) at the end for us. Around the first week of February we were going through our traditional litany when I heard myself say, “St. 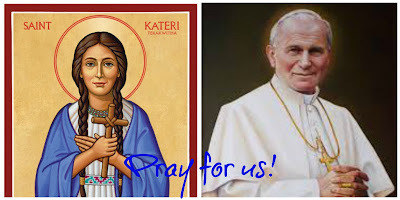 John Paul II, pray for us.. St. Kateri Tekawitha, pray for us.” And then I said out loud, “Huh. Where did they come from?” Sure, JPII is a family favorite. I’m a Theology of the Body junkie after all, so adding him to the list seemed appropriate. But St. Kateri Tekawitha? I didn’t know anything about her except that she’s the first Native American Saint and that her feast day is some time in July. Why on earth would she come to mind? I sort of shrugged it off , but we kept them in the litany from that point on. Little did I know, this wasn’t some kind of fluke. St. Kateri and John Paul II knew something that I didn’t. I took a pregnancy test. It was positive. I’m due on October 21, the day St. Kateri was canonized a saint. October 22 is St. John Paul II’s feast day. This pregnancy is different from the other two. For one, this is the first time we are really and truly surprised that we are pregnant. We had very much been planning to wait the doctor’s recommended 3 months after the miscarriage before trying again, if not longer. So when I read the word “Pregnant” on the test, my first reaction was fear and worry… what if I had put this baby in danger by simply not waiting the amount of time my doctor had suggested? Thankfully, my husband was incredibly encouraging (and continues to be) and reminded me that no matter what this child is a gift. Any woman who experienced a loss of any kind will tell you that the next pregnancy is just different. I hesitated to accept the news, I struggled to open my heart to the excitement and joy out of fear that it would be stripped away. Lent was a journey of healing, rediscovering joy, and realizing that this child deserves to know that he or she was loved from the moment of conception. Fear can’t get in the way of opening my heart. This Friday I will be 15 weeks pregnant. There has been plenty of morning sickness, nausea, and heartburn… which I’m grateful for, because it means things are moving along. Yesterday I had the joy of hearing this little one’s heartbeat for the first time, which gave me a renewed sense of peace. While I’m not sure the anxiety or questions of “what if?” will ever go away completely, I do feel like I’m able to surrender my worries into God’s hands. I think one of the greatest comforts of this pregnancy so far has been knowing that we have a Little Saint in heaven praying for his younger brother/sister, and the intercession of St. Kateri and St. John Paul II. No matter what happens, God knew I needed prayers even before I knew I was pregnant, and that gives me hope! For those struggling with infertility, hurting from miscarriages and the loss of children, and those who are longing for a child of your own… Please know that you and your intentions have been close to my heart, and I will continue to pray for you throughout this pregnancy and beyond. For all of you who have been praying for our family since we lost our baby in December, I cannot express adequately how meaningful your prayers are to me. Your prayers, encouragement, and this baby have helped joy return to my heart.